We follow our joint purpose with a collaborative spirit. 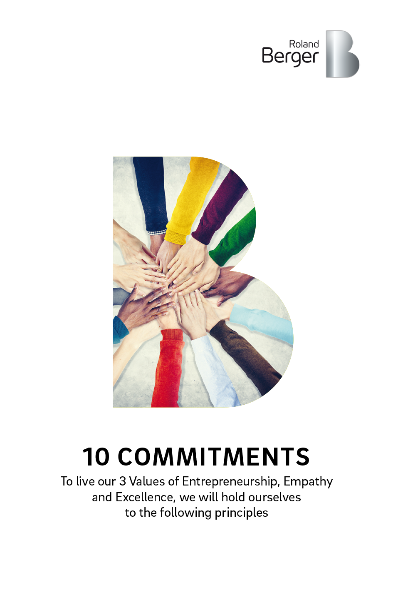 To live our 3 Values of Entrepreneurship, Empathy and Excellence, we will hold ourselves to guiding principles, directed towards both our clients and employees. We aim at providing our clients with the best we can offer as a firm and as excellent and entrepreneurial people, and to exceed their expectations whenever possible. We focus on understanding their real problems and offer tailored approaches. We are in search of the "wow" effect. We respond with agility and responsiveness to clients' requests and act in their interest as trustworthy and loyal business partners. We are looking for the client to be our first promoter based on the quality and professionalism of our work. We take pride in our entrepreneurial spirit. Our DNA urges us to depart from the beaten tracks, to take up challenges,to accomplish extraordinary achievements and to take risks. We are eager to find innovative solutions to help our clients be game changers in their environment. Our innovative mindset comes with tangible results and impact for our clients. Our findings, conclusions and recommendations are always based on our deep analytics and fact based approaches. We bring an independent view and will take a stand if we believe it is in the best interest of our clients. We are not influenced by outside or internal political interests. Consulting is a team task where excellence is achieved when we apply the full range of our diverse skills. We always approach acquisition and project staffing based on the right people combination for the job. We banish any "I, me and myself" culture. We continuously act as one firm. We commit to maintaining and extending our professional relevance; deepening our understanding of our clients' industries, extending our functional know-how, building our networks of expertise and intellectual property to support our collective ability to address our clients' most pressing problems and to anticipate client's needs. This comes with our full respect to the confidential information of our clients' and of our own firm. We strive to attract and retain the best talent. We commit to actively support the personal and professional development of all employees. We help our people to grow their careers: their knowledge, their know-how, their personality and their personal skills. We listen to their needs and suggestions and we recognize our role in providing on-the job training, formal training, and regular feedback. We are a meritocracy and reward contributions to our success. We lead with courage and by example to inspire our colleagues. We cultivate the passion for our profession, the taste for having dreams and the ambition to realize them. We respect our word and act with transparency. We value open discussion and debate in decision making, but once made, we stand by the decisions taken by our community and will take all necessary steps. We reinforce our values by living our commitments. We are a diverse community and recognize our diversity as strength. Heterogeneity is our hallmark. We value others' perspectives and feedback to improve ourselves. We do not allow ourselves, or others, to be negative about the members of our firm. We act with humility internally and with our clients. We commit to tolerance and respect to human dignity wherever we are and whatever we do. We promote corporate social responsibility. We are respectful of the cultures and diverse realities of the countries we work in and the clients we work with. We act with honesty and integrity. We are proud of what Roland Berger stands for and take pride in our firm's and colleague's accomplishments. We create a working environment that people appreciate and that enables the individual to achieve excellence in a positive spirit and with passion for our firm. We celebrate our collective successes. Our success stories build and nurture our identity and our values. We strive on making our community stronger tomorrow than it ever was yesterday. We follow our joint purpose with a collaborative spirit. 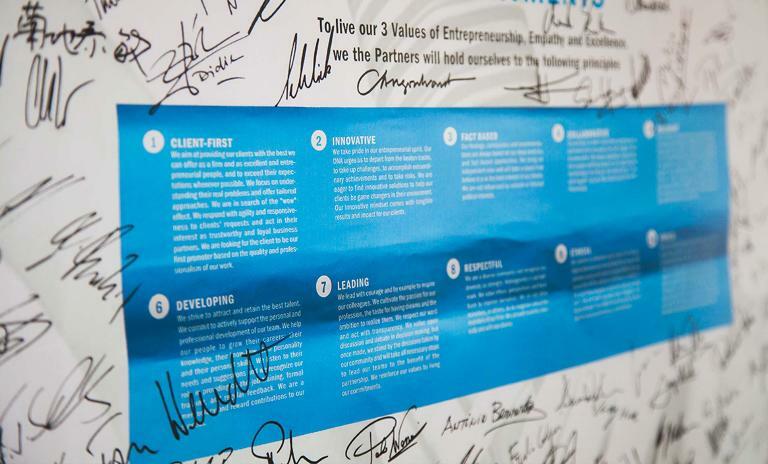 To live our three values of Entrepreneurship, Empathy and Excellence, we will hold ourselves to guiding principles, directed towards both our clients and employees.